Beyond their vital role in the Church’s mission of providing young people with a strong formation in the faith, studies consistently have shown that Catholic schools outperform their public school counterparts in student academic achievement. The longer a child attends a Catholic school, the greater the impact. This is attributed to many factors, including a solid core curriculum, teacher dedication, classroom discipline, religious, moral, and spiritual development and demanding academic requirements. In addition, the nurturing learning environment, and the values-based setting of Catholic schools encourages the student to develop self-respect, respect for others, and a strong commitment to living a life of faith and civic involvement. A Catholic education is an academically challenging education. High academic standards, an emphasis on moral character development, effective structure and discipline and a supportive atmosphere of caring all combine to foster excellence in education and the development of the whole person. Outstanding student performance is supported by the evidence. Catholic High School students attend post-secondary education at a rate in excess of 95% and are more likely to complete their program of studies. A Catholic School education is money wisely spent. Your child's tuition is an investment which pays lifelong tangible and intangible dividends. Standardized test scores and a college acceptance rate of 97% reflect that our students are self-disciplined, self-motivated, responsible, and creative. Athletics, Drama, and community service programs are integral parts of the educational process. A Catholic School recognizes the parents and family as primary educators and joins with them to form a supportive, living community of shared visions. Catholic Schools help students understand that each person is unique and valuable with God given gifts and talents. Catholic Schools encourage family input and involvement in the ongoing education of their children. Research shows that such an educational partnership results in higher attendance rates and lower dropout rates. Every child shares in an educational environment filled with love, caring and concern -- a community joining together to help create a better world. Catholic Schools engage in an ongoing process of evaluation, certification, and accreditation of both teachers and programs. 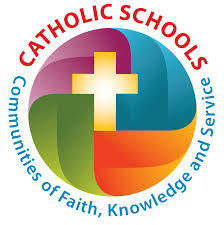 Their accountability guarantees the high standards that are an integral part of a Catholic Education. Catholic School faculty members are highly qualified professionals committed to bringing out the best in their students as they grow in knowledge, skills, and values.